Hello to all Gloria’s friends. 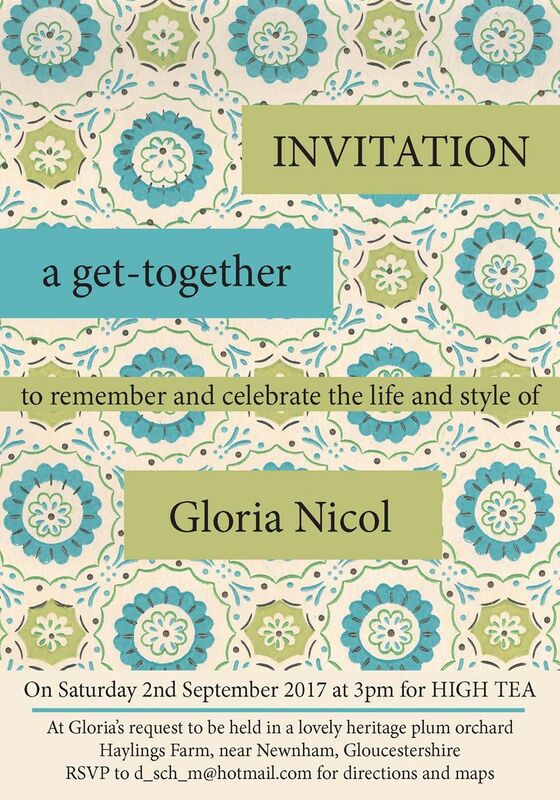 We are organising a get-together to celebrate and remember our dear friend Gloria on the 2nd September. The gathering will be in a lovely heritage plum orchard not far from where Gloria lived and where she recently did a lovely photo story for Landlove Magazine. (see this month’s edition). In true Gloria style, we will have a lovely vintage tent, Tea, home cooked cakes, jams and preserves and much more, Even Gloria’s favourite….washing lines! 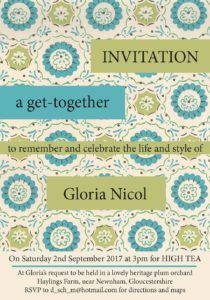 If you are a friend, worked with her or were one of her great admirers, here is the invite, which includes an email address for RSVPs, please do so soon as we need to know who is coming. There will be limited parking in a nearby field and a friend will collect guests from Lydney station. I was visiting my Mum in hospital over Christmas and suddenly became aware that I was talking about the price of potatoes. I wisely stopped short of telling how I had bought 2 bags of organic spuds on special offer for just £2 the previous day! Once I realised the mundane nature of my conversation, it struck me as so absurd I was stricken with a bout of hysteria that left me unable to speak for 10 minutes or so, no doubt to the relief of the other family members present. You see, I find frugality and penny pinching totally dull. Having said that, whereas 6 years ago I wouldn’t have been able to tell you the price of butter, times have changed. I’m now a dab hand at rustling up a feast using ingredients from the ‘reduced for quick sale’ bin at the supermarket and can sniff out a bargain a mile off these days. 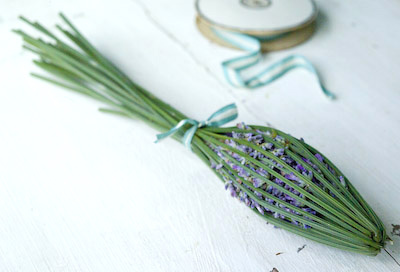 There seems to be an assumption that preserving is part of a ‘make do and mend’ mindset but for me it is far from that. It is primarily about the quality of the food we eat, taking notice of and making use of what is often right there on our doorstep, respecting those ingredients and reducing waste in the process. At the same time, by following the seasons through ingredients it certainly reminds me to savour the seasons, so time doesn’t simply pass by in a heartbeat. 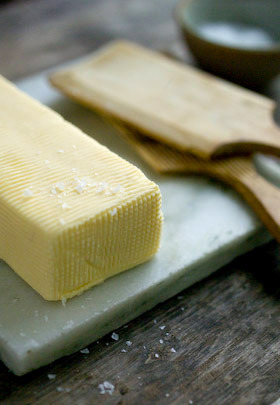 I’ve been wanting to make my own butter for ages. Having read quite a bit about it, it was a matter of finding the raw ingredient, to have a go. Last June my wonderful canning chum Tigress wrote here about making enough butter to see her through the year, freezing the butter and bi-product buttermilk. Much respect Tigress, who having driven to Vermont to collect the cream, then hand churned it one Mason jar at a time! Nothing quite so romantic or arduous for me, I was just waiting for the cream to appear at the supermarket on special offer, then my trusty vintage Kenwood Chef would do the hard work for me. With Netherend Dairy just down the road producing butter that is highly appreciated in foodie circles, there is hardly much point in making my own unless the cream comes at a bargain price. Seemingly, once Christmas is out of the way, the supermarkets have plenty of excess cream going cheap, ridiculously cheap. 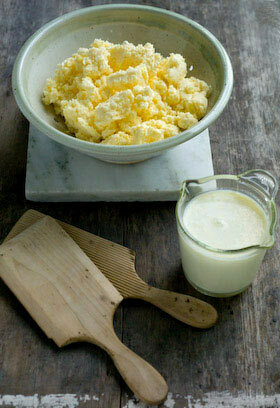 To make butter you need normal double or whipping cream, not the UHT longlife stuff. I bought up plenty last week and have been pleasantly surprised by how much butter it has turned into, much more than I’d expected. Being short of freezer space I now have the problem of where to put it! Using a Kenwood Chef or other stand mixer fitted with paddle or ‘K’ beater, beat the cream on a medium speed for approximately 10 minutes, keeping a keen eye on it towards the end. 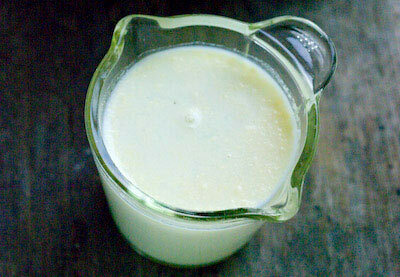 The cream will thicken then begin to stiffen, then in an instant the butter and buttermilk separate. At that moment you need to be ready to turn the mixer off, otherwise the buttermilk sloshes all over the place. Pour into a sieve, collecting the buttermilk in a bowl underneath. 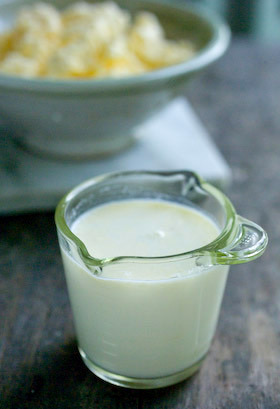 The butter needs to be washed in water to remove any other buttermilk trapped inside it. Some people use their hands to mash the butter under a running tap, others use a potato masher. Whichever method you choose, the water needs to run clear as any buttermilk remaining will encourage the butter to go rancid quicker. Once all the buttermilk is away you can press the butter into a bowl or give it a good wacking with butter pats, which leave lovely traditional ridge patterns on the surface. If you wish to add salt then this is the time to work it through the butter so it is evenly distributed. The butter can be wrapped in waxed paper or placed in sealed storage boxes before freezing. The buttermilk can be used for baking and I have frozen some in smaller cup-sized containers so they are handy sized for when I want to make scones, soda bread or my blueberry buttermilk and almond cake – yum! This apricot vanilla buttermilk scone recipe is another great way of using both butter and buttermilk. I love making these for breakfast as they aren’t too sweet and are soft enough to be eaten without any extra butter spread on them. 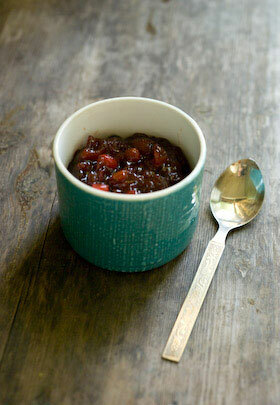 You can of course add a dollop of jam if you really have too and serve them for tea later in the day. Sift the flour and salt into a bowl. Cut the butter into pieces and rub into the flour until the mixture resembles breadcrumbs. Add the sugar and dried apricots. Mix the vanilla extract into the buttermilk and add it to the flour mixture, working quickly with a fork to form a dough which is soft but not sticky. Bring the mixture together and with floured hands press it onto a floured surface so it is about 2.5cm (1 in) thick. Cut out scones and place on a greased baking tray. Push the dough offcuts together again and cut the last scone or 2 from that, so none goes to waste. 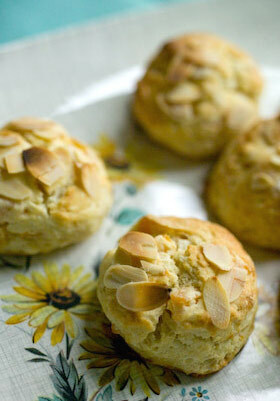 Brush the tops with buttermilk and sprinkle with flaked almonds. Bake for 15-20 minutes until they are risen and starting to be tinged golden. Remove from oven and eat them warm. They are lovely split and toasted later on too. I prefer to use the ingredients I find on my doorstep, but sometimes occasion decrees it’s time to push the boat out. I’d love to find homegrown cranberries but have never seen them for sale on my travels, though Sainsburys are selling Kent grown cranberries this year, but only available in that area. So for my special Christmas jam, my cranberries are from the US, dried apricots from Turkey and pineapple from Costa Rica. I hope all you locavores will forgive me! For some of you lucky enough, these ingredients will be on your doorstep. I saw mention of this combination in an old book of mine and thought it worth exploring. In that recipe the pineapple came in a tin and for my first experiment I used a tin of crushed pineapple in natural juice. Having noticed fresh pineapples not much different in price to tinned, I decided to use fresh for my second batch. Both work well with perhaps the fresh having just that added zing you might expect. 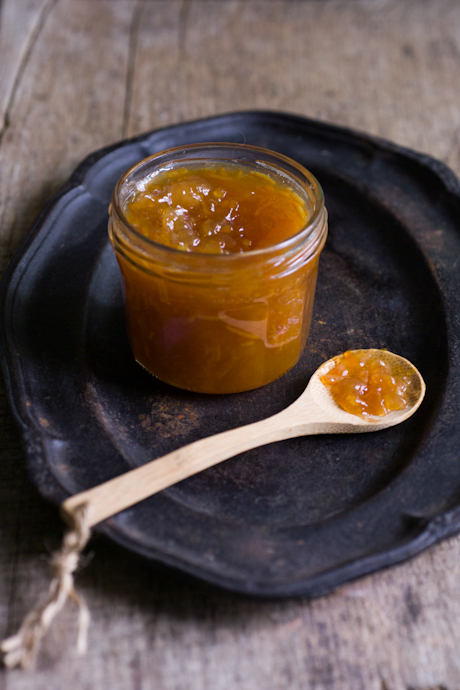 The final flourish – apricot brandy, just makes this fabulous jam extra special, befitting the season. The fruits cook down to a ‘feltly’ consistency, which from my experience means you need to watch it doesn’t catch on the bottom of the pan and burn. So don’t leave the bubbling jam kettle for even a minute or your jam may be spoilt. My recipe calls for relatively little sugar. This does mean that it is advisable to store the preserve in the fridge or the ideal alternative, do like I do and can it. That way it will store for a year or even longer. Serve on toast, scones or with your celebration meal as a relish. I’m off to make some more. Prepare the pineapple; slice off the top and base and pare away the skin. Chop down through the centre lengthways and cut into 4, then remove the woody core. Slice the flesh into chunks then pulse in a food processor to give a fine texture. 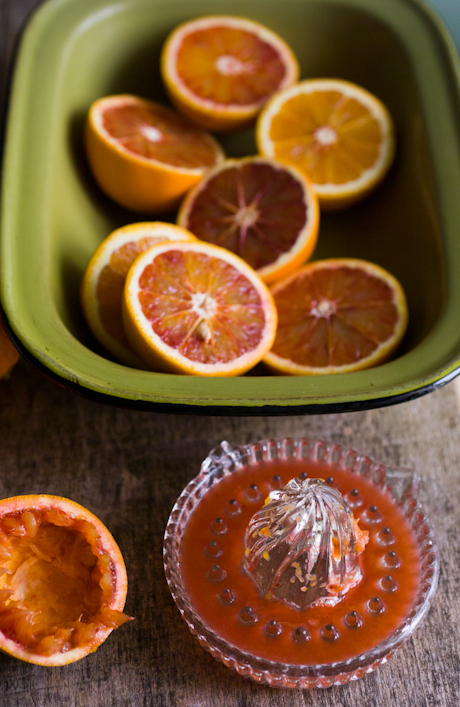 Pour into a sieve over a bowl and collect the juice that drips through. With my 1100g pineapple, this gave me 280g (10oz) pulp and 200ml (7 fl oz) of juice. (You don’t need to be spot on here just aim for approximately that amount.) Chop the apricots into small even pieces and place in a bowl with 200ml (7 fl oz) of boiling water plus the pineapple juice and leave to soak for several hours or overnight. If you plan to can (water process) your jam, prepare the water bath and jars and place jar seals in a pan of hot water on the hob. 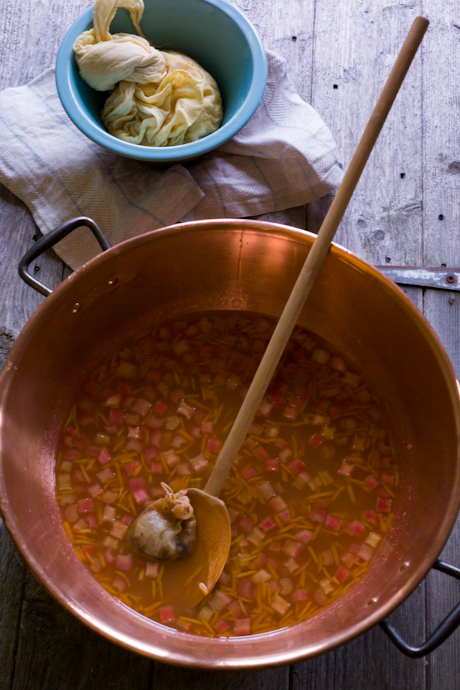 Alternatively, prepare clean jars by sterilising them in a low oven, keeping them warm till needed. 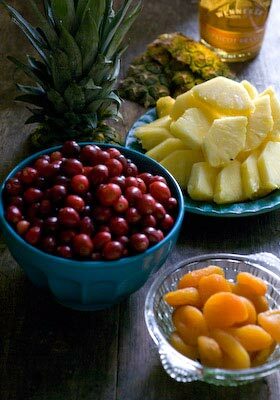 Place the cranberries, apricots, crushed pineapple and soaking juices in a preserving pan. Add another 200ml (7 fl oz) water and cook gently for approximately 20 minutes, until the cranberries have started to pop and the mixture combines and takes on a ruby glow. Remove from heat for 5 minutes then add the sugar. Stir over a gentle heat until completely dissolved, then up the heat and bring to a rolling boil, taking great care that it doesn’t burn. It only takes 5-10 minutes before you can see the texture is thickened and a small blob on a cold plate will hold its shape. Turn off the heat. Leave for 5 minutes then stir in 3-5 Tbsp apricot brandy. Pour into prepared hot jars leaving 0.5cm (1/4in) headroom, tap jars on worktop to de-bubble, clean rims and seal, then process for 10 minutes. Remove jars from water bath and leave until completely cold before testing the seals. 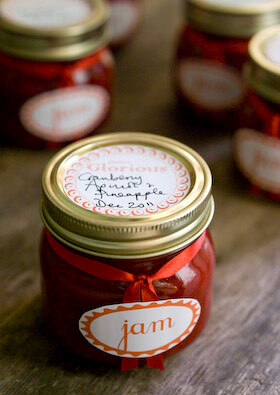 Alternatively, pot the hot jam into clean hot jars and seal then store in the fridge when cold. Apologies for my long absence. I’ve been reassessing how I allocate my time! That and my Mum being ill has given me a lot to think about. That doesn’t mean I haven’t been busy though. Once you have been following the seasons with ingredients, watching, anticipating, harvesting, canning and preserving for a while, it becomes second nature, the way that you live and a direct and real connection to the food you eat. I’ve become particularly aware of this by being displaced due to my Mum being ill. I have by necessity been spending time away from my home and my patch, the place I have been observing and making use of so intensely for the last few years. It just meant I’ve had to find new connections in a city I left 30 years ago. 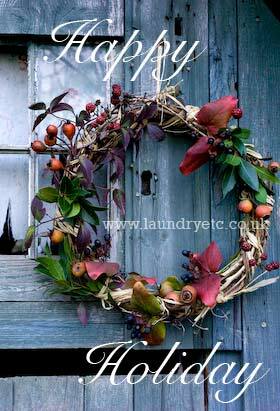 Yesterday it was time to rustle up my Christmas wreath. The wreath base has been used on previous occasions and is a favourite; washed and weathered, looseley twisted vine that comes already wrapped with some tatty raffia from a previous incarnation, perfect. I wanted my wreath to be a celebration of what nature has handed me in 2011 and would have searched for a few remaining sloes on branches or scavenged some crab apples of a neighbours tree, but I didn’t want it to turn into a performance. So I just went around the garden looking and snipping and then very simply pushed stems through between the twisted vine base. I used some lengths of straggling clematis that the cold had turned dark crimson, some plump orange-red rosehips, sprigs of bay; the fresh growth tips of bay trees branches, hypericum with black fruits set amongst stunning red tinted leaves and finally some unripe blackberries that found themselves double-crossed by deceiving weather conditions. You don’t need much for it to work. My tip if you are new to this sort of thing and want to have a go, is to use your foliage in 3’s, to give a loosley structured and organic result odd numbers work best. I hope that you enjoy the holiday season ahead, whatever it means to you and look forward to starting afresh in 2012. In such uncertain times one thing shouts out to me loud and clear – CANNING IS THE WAY TO GO! Just saying. Have a good one. There is much excitement close to home, as me and next door are about to collaborate on our first chicken keeping venture. 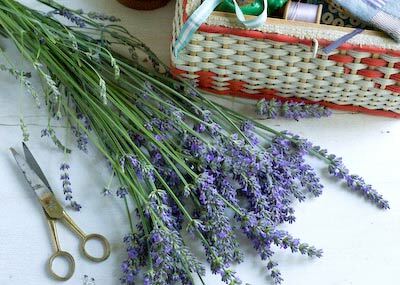 We have placed our order for 5 orpingtons; 2 lavenders, 2 buffs and a lavender cockerel, and will be taking delivery in a couple of weeks time. We can’t expect any eggs from them until around November time but most importantly – the names have been chosen. As I’ve never kept chickens before I’ve begun to swat up on them. I do know people who keep chickens, so suspect it isn’t too difficult and can already see which way this new interest is likely to go as even at this early stage we have started to discuss other breeds we might like and what colours of eggs they will hopefully produce. In the meantime, I bought my first book on the subject; Hens in the Garden Eggs in the Kitchen by Charlotte Popescu. I’ve collected several other books of hers and can really recommend them. As well as chicken keeping, she writes about other subjects close to my heart, from wild fruits and apples to vegetable gardening and bee keeping. They are all small paperback books packed with useful information and recipes presented in a very simple and modest way. In my new hen book she gives this really useful guidance about the freshness of eggs, particularly relevant to those people who know exactly when their eggs are laid. If you are buying shop bought you’ll just have to guess I’m afraid. Your eggs need to be as fresh as possible if you want fried or poached eggs. For boiled eggs that you wish to peel, it is best to use eggs that are about a week old as the shell and skin are really difficult to peel off on fresh eggs. …. 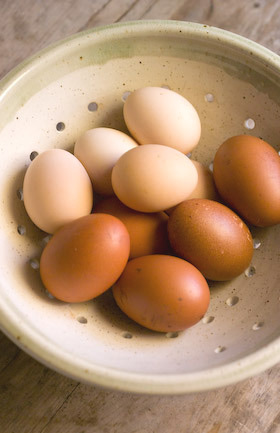 If you are scrambling your eggs or making an omelette, eggs can be up to a week old. 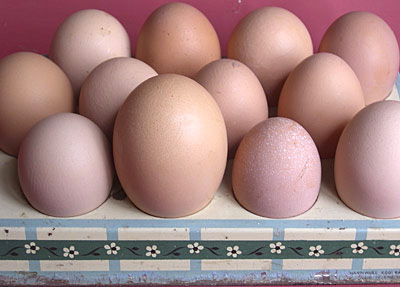 For baked dishes, eggs can be older than a week. If you want to separate the yolks and the whites to make meringues, eggs are best a few days old as the whites whisk up better if not too fresh. Pickled eggs have never interested me until I came across a recipe for Pickled Huevos Haminados in another lucky find, The Mediterrannean Pantry by Aglaia Kremezi, published 1994. As soon as I read the recipe I knew I had to make it, though haven’t done so yet. I’m actually growing the red onions at the moment, which is, I suppose, beyond the call of duty. I have found the recipe online here if you fancy having a go and beating me too it. I’ll be tempted to serve a pickled egg with some asparagus spears pickled earlier. This week I’ve been trying to make some room in the freezer before the berry season kicks off. I’m not a big fan of freezing as mine works on an ‘out of sight out of mind’ principle. I tend to forget what’s in there, all the while those ingredients are racking up additional running costs! (This year I’ll be canning fruit in jars as much as I possible.) I used a tub of blackberry puree, picked and prepared last August, and rustled up 4 pots of blackberry curd, which is a delicious way of using up eggs. A spoonful or two of fruit curd swirled through some Greek yoghurt is fabulous, or you can use it as the filling in a simple sponge cake or dollop on meringues (making use of even more eggs). Oh yes, I’ve got eggs on the brain and this is only the beginning. Today is a gloriously sunny day but it doesn’t fool me. We’ve already had a few nippy evenings, sent to prepare us for autumn ahead. Hopefully, we’re due a good September weatherwise but Autumn’s coming whether we like it or not. So as well as lots of canning projects over the next 2 months to stock up the store cupboard (more plums, damsons, apples as well as pears, quinces and all the hedgerow berries to look forward too), I’m also trying to get a few other jobs done to make life warm and cosy. I really must replace the fire bricks in the Rayburn soon, it’s no good leaving it till the weather has already taken a turn for the worse. There is a box of them beside the Rayburn, been there since last year. And I need to get the chimneys swept. 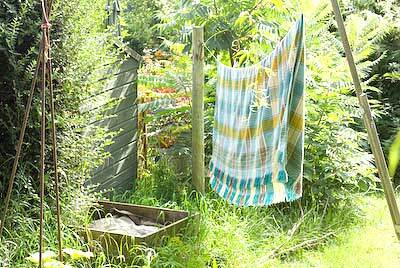 I intended laundering all my blankets in the spring, but didn’t get around to it, so today resolved to make a start. I love blankets and as you can see, once they are collected together, I have quite a few. 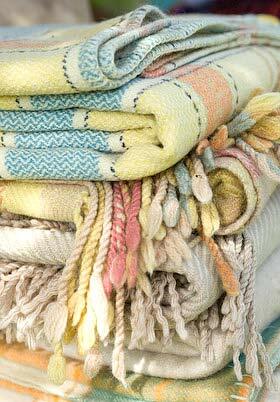 Vintage Welsh blankets are my favourites, the weaves and colours are just wonderful. So first I piled all the blankets up so I can work my way through them, washing them one by one, restoring them, to their pristine glory ready for colder months ahead. I have 5 cats so my house consists of lots of cat beds, in fact it is lots of cat beds all joined together. The blankets collect fur as well as dirty wet paw marks. I have on occasions washed blankets in the washing machine with sometimes good, sometimes disastrous results. I’m not prepared to chance it with any of my precious blankets. They are all pure wool and some feel more robust than others. If your blankets say on the label to wash in the machine, then you’ll be fine. Don’t think any of mine have labels so common sense is the best approach. Once wet, they become big heavy unwieldy things to handle so you do need a bit of muscle and a cup of tea and a biscuit (or a prize winning scone perhaps!) every now and again. 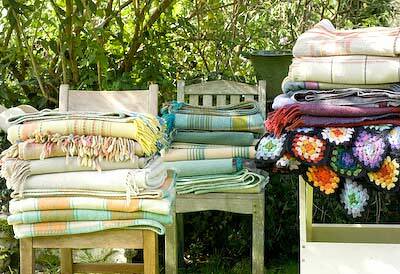 Give your blanket a good shake out doors. If like mine, they have animal hairs on them, it is a good idea to run the hoover over the hairy bits, holding it taught as the suction of the nozzle removes the excess. If your blanket has any stains, these will need to be dealt with as appropriate for its type. A good old fashioned bar of soap rubbed into the stained area will sort out most stains, but dried blood or grease marks may require a product designed specifically for that job. Don’t rub the area with too much gusto otherwise it could felt the surface of the wool. If your blanket is too large to fit in the sink use the bath. 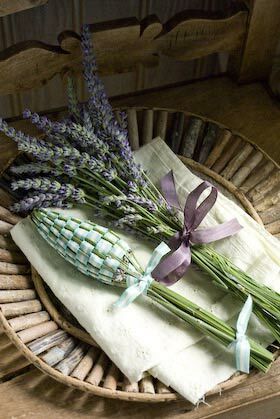 Fill the sink or bath with plenty of lukewarm water, so the blanket can move about in it, and add some soap flakes, Woolite or Stergene to give a good lather. 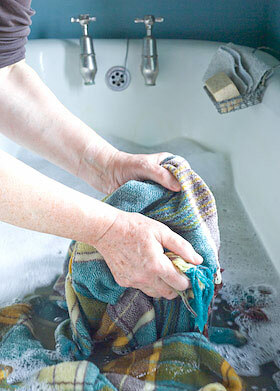 Lower the blanket into the water and agitate it gently, working around the blanket but not rubbing it excessively. Remove the plug and allow the water to drain away and try and gently squeeze out as much excess water from the blanket as you can. This is where you need muscles. A washing up bowl or bucket is also useful here, as you can lift the blanket into it while you rinse out the sink or bath and refill with clean warm water for the first rinse. It is really important that wool blankets are not subjected to sharp changes in temperature to prevent felting, so try to keep the water at a similar lukewarm temperature throughout. Rinse the blanket a couple of times in clean water until the water stays clean and shows no sign of suds. You can add fabric conditioner to the final rinse if you wish. Lift the blanket and squeeze as much water as you can from it. If you have a washing machine robust enough to take the wet blanket you can then spin it in the machine. If the blanket is too heavy for your machine you will need to fold the blanket, place it flat on a large towel and then roll the towel up so it soaks up the excess liquid from the blanket. Hang the damp blanket on a washing line out in the fresh air and use plenty of clothes pegs to hold it straight and taut. Pull the blanket into shape so warp and weft threads run straight, giving any tight edges a gentle tug and stroke out any creases. 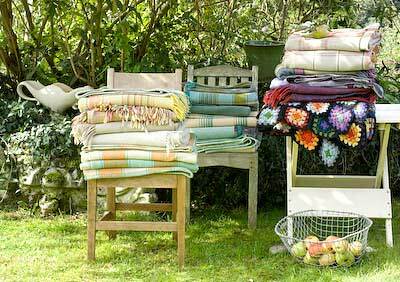 A gentle breeze on a warm day is the ideal scenario so your blanket will dry quickly and be in great shape. If you have the time, move the blanket part way through its drying time and re-peg, that way you wont end up with a crease where it is folded over the line and it will prevent the pegs from making indented marks on the fabric. 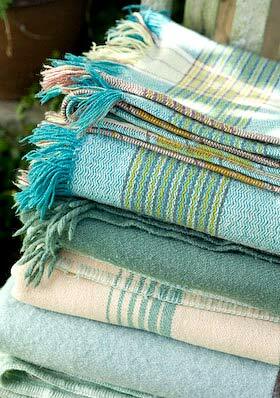 Your blanket should now be clean and soft as well as smelling as fresh as a daisy. So that’s one blanket sorted. Only another 15 to go! I grew up in a Lancashire mill town, in a brick built terraced house with a flag-stoned back yard. Apart from a short period when Uncle Tom and Aunty Nora owned a market garden, when I was about seven years old, I never saw first hand how fruit and vegetables grew. I can recollect a few occasions when cherries were in season and my Dad would buy a brown paper bagful from the greengrocer. Dad liked cherries. These bright polished berries were a thing of beauty. An essential part of this rarely played out ritual was to sort them into singles, joined pairs to hang over your ears like pretend fruity earings, and bunches of three or even four to balance on your head, Carmen Miranda Style. Then they were wolfed down with great delight and the stones and stalks discarded. As I’d never seen them growing on the tree I hadn’t the slightest inkling that this fruit could be British. As I grew older I thought that France was the big cherry capital of the world as there was something about French style; cherry motifs stencilled on crockery and embroidered on cute shelf edgings that gave them assumed ownership. I’ve got an old Habitat catalogue from the 70’s which includes a feature on making cherry jam, tapping into that Elizabeth David influenced generation, when discovering all things French was the thing. It has only been relatively recently that I’ve realised we have a rich tradition of cherry growing here in the UK, albeit a dwindling one. According to Food Lovers Britain, who are behind CherryAid, a campaign to save the British Cherry, in the last 50 years Britain has lost 90% of its cherry orchards. 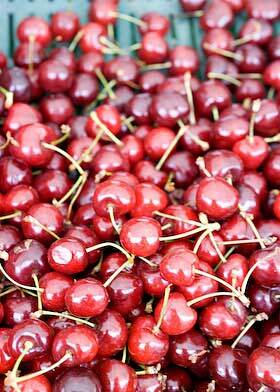 Most of the cherries available to us are now imported. The campaign aims to encourage us to celebrate the British cherry, ask for British grown fruit where we can and plant a cherry tree, hopefully choosing an old-English variety. A week or two ago, my rhubarb man (see my last but one blog post) gave me a big colanderful of sweet cherries from his tree. It had been a race to harvest them before the birds nabbed them all. An abundant crop is necessary to guarantee that after the birds get their fill there’s still some left for us humans. My haul meant there were handfuls to eat fresh but I wanted to preserve some as well so decided to pickle them. I looked up ‘Cerises Au Vinaigre’ in Jane Grigsons Fruit Book, always a reliable reference book for these things, and also found ‘Spiced Cherries’ in The Perfect Pickle Book by David Mabey and David Collison. 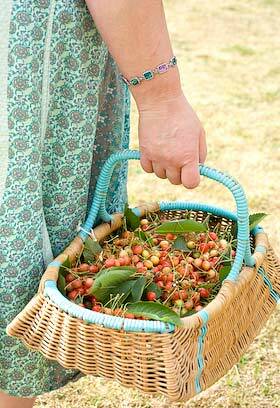 Pickling cherries is simplicity itself, you just make a sweetish, spicy vinegary syrup, pour it over the prepared fruit packed into a jar and wait for a month or two before eating. Both these recipes worked in this way, give or take a sprig of thyme here and a few juniper berries there. Easy as anything. Then fellow CanJammer Leena posted her Chinese Five Spice Pickled Cherries for the June Tigress’ Can Jam, and the recipe is so simple I decided I’d give it a go instead. As is often the way with preserving, preparing the fruit can be the most time consuming part of the procedure; sorting the perfect fruit from the blemished, removing stalks and stones, topping and tailing. Readying my cherries was no exception. Years ago I’d bought my Dad a cherry pitter when he mentioned to me he was having trouble finding one and I’d bought another one for myself at the same time. I knew one day it would come in handy and twenty years later it at last had it’s first outing. You can dispense with pitting them altogether if you prefer. So I pickled my cherries and canned them as well (just because I’m into canning), though the canning part may not be entirely necessary in this instance. You are supposed to leave the pickles to mature for at least a month but I opened a jar after only a week and they are heavenly. 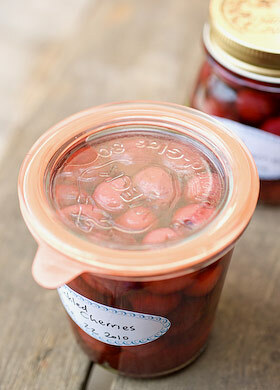 I’m now desperate to pickle more and stock the larder for when fresh cherries are just a vague memory of seasons past. I’m like a super sleuth on the trail for more cherries, sweet or sour. The CherryAid campaign is encouraging everyone to cook something during the British cherry season using British cherries, so do have a go at some pickled cherries. They aren’t too sweet or sour but just enough of both and even the syruppy juice is delicious drunk as a cordial. I can eat them straight from the jar but they do make a perfect pairing with goats cheese. 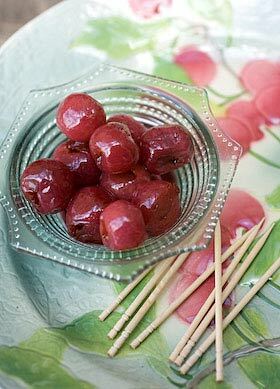 If you have sour cherries they will have a bit more bite to work alongside stronger flavours. I’m planning to plant at least one cherry tree this coming winter, now that this fruit has become my new best friend and I need my own supply. CherryAid is holding a cherry themed FoodLovers Market in Soho, central London on Saturday 17th July (National Cherry Day). Each month when the Tigress’s can jam canning challenge ingredient has been announced, I’ve been relieved that it wasn’t up to me to choose. Being the only Brit taking part, it seemed such a massive responsibility to come up with a seasonal ingredient that would somehow accommodate all canjammers, travel half way around the world and fit into everyones canning calendar. Then the other day Tigress emailed me to say it was my shot and for a moment I was filled with dread. I say a moment, and it really was just a moment, as if by divine suggestion, the word ‘cucurbits’ fell from the sky and landed right on my head. 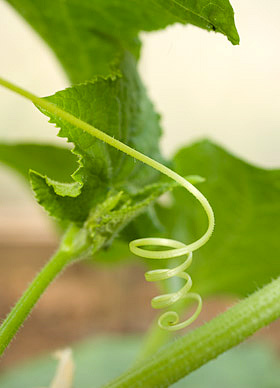 The Tigress’ Can Jam ingredient for July is cucurbits, but it’s cucurbits with a proviso (see below). In case you aren’t familiar with the term cucurbits, it refers to Cucurbitaceae, a plant family commonly known as melons and gourds, including crops like cucumbers, squashes (including pumpkins), loofahs, melons and watermelons…. So what’s the proviso? First let’s dispense with the loofahs! (too chewy), secondly, pumpkins and winter squashes, they’re out. It is most likely too early for them anyways but also they are troublesome ingredients to deal with for hot water processing and I aint taking responsibility for that. So that leaves cucumbers, a traditional pickling favourite and one I want to learn lots about from you experts over in the US. (By the way, as far as I’m concerned, bread and butter pickle should actually contain what it says on the jar. Likewise ‘coffee cake’ Anyhow, I digress…) Summer squashes such as courgettes and marrows… ha… gotcha! Of course this is yet another strange difference in the language we share. To all you canjammers in the US, small zucchini and zucchini. I have Sarah at Toronto Tasting Notes to thank for help translating here. 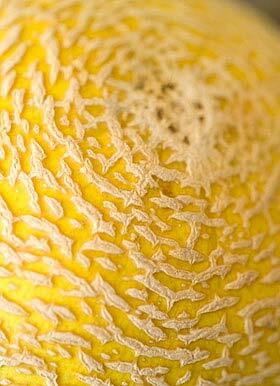 And finally, to bring a luscious sweetness to the proceedings, melons of all types. I’m hoping this group of ingredients is specific enough to make sense as well as being wide enough to cater for everyone. I am finding that Tigress’ Can Jam is giving me the opportunity to try new ingredients I’ve never worked with before, as well as making me approach familiar ingredients in new ways or ways I hadn’t got round to trying. I think these cucurbits offer scope for all manner of pickles, chutneys, relishes and jams and I can’t wait to see what everyone comes up with, as six months in, the canning done so far has been a total revelation. 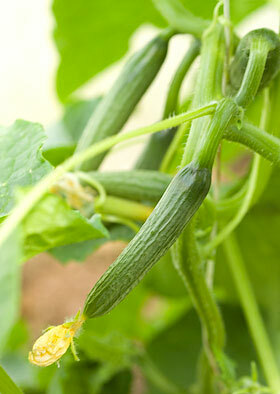 As previously mentioned, I want to learn how to can my cucumbers like I’m in that Little House on the Praire. Marrows, zucchini to most of you, I’ve always considered a waste of everybodies time, but I’m now ready to reconsider. 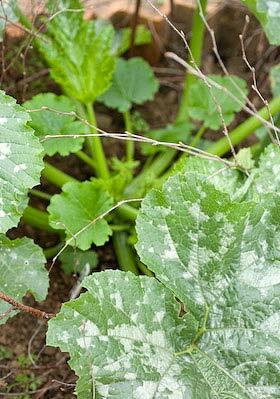 There are endless recipes for marrow chutneys and jams and as this vegetable is effortless to grow, I really think it is time to learn to love this clod-hopping monster of a gourd. Courgettes, or small zucchini, are one of those glut kitchen ingredients that there are never enough uses for to reduce the surplus mountain, so it will be fabulous if some of you could come up with some essential recipes that the rest of us can’t live without. 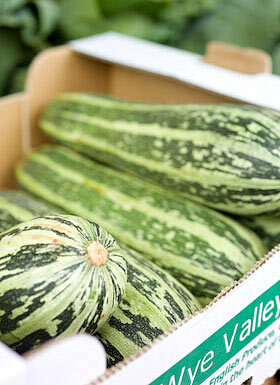 And then there are the melons…. they fill me with such romantic notions; from the pickled watermelon rinds I’ve read of and dreamed about tasting, the spicy syruppy concoctions that might be sweet and sour at the same time, and finally, French inspired preserves, combining melon with lemon, or ginger, or raspberries, or peaches, that transport you to a village in Provence. Are you getting the gist? 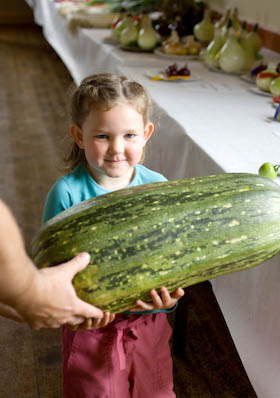 I hope you feel inspired to go off and make cucurbits your own. I can’t wait to see what you come up with. If you need to refer to Tigress’ canning guide you will find it here. All recipes must be posted between friday july 16 and friday july 23rd, with friday july 23rd at midnight being the cut off point. Tigress has allowed two extra days at the beginning this month so if you are so inclined and you can get your post up on the earlier days, please do! as it will help her to get a head start on the round-up. (Bravo Tigress for all your work).